V220: The Parisian Gown - Finished! I like how versatile a polonaise'd skirt can be - wear it up with a walking-length petticoat, or down with a full-length petticoat. I don't have it pulled up all the way here, just a bit. 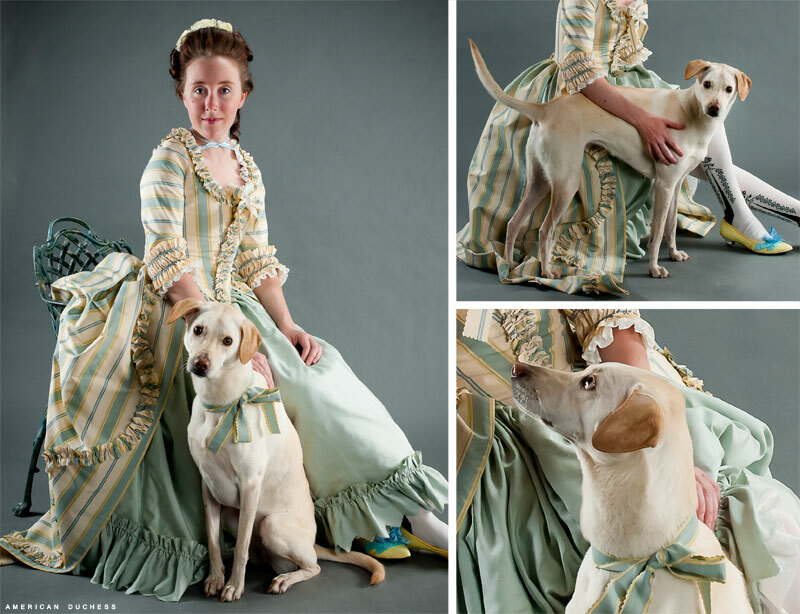 Historical Dog wanted to be in the photos, that is, until I tied a bow around her neck, then she wasn't so sure. This photo shoot was for promoting the new clocked stocking line (you'll recognize the picture on the left from Facebook maybe). Legs aside, I finally got a chance to wear the painted and be-ribboned Pemberlies I made ages ago, for this dress. 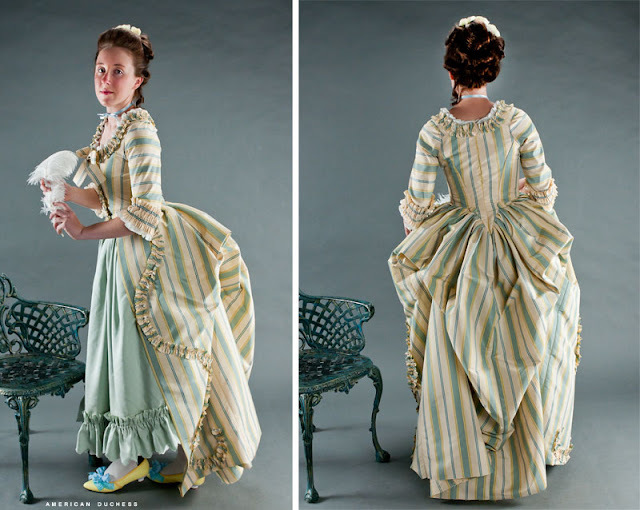 - Worn over prow-front stays, small panniers, and one petticoat. - Stockings and Shoes from my line. This gown turned out beautifully! I love how you've styled yourself too. The photo shoot came out wonderfully! Gorgeous! HISTORICAL DOG!!! Your dress turned out beautifully -- altho it was more work to make the bodice twice, I'm glad you did because V2 turned out so great! It was fun to have you at CoCo even if I only did get to see you briefly! I love it! This may be one of my very favorite things you've ever done--it's just so wonderful! Absolutely dazzling, you look beautiful! What apparel are you wearing under the gown to get the back so puffed out? Tricia, for undies I am wearing stays, then a bum pad and small pocket hoops, The Ugly Puffer, a cotton petticoat, then the green petticoat. I know typically bum pads and panniers were not worn together, but the back seemed a little flat without the bum pad. The stripe fabric also has a lot of body in it, making for good poufage. It looked really lovely in person too, you styled it all so nicely. AHHH! You look great! You inspire me to sew more!! Just moved to a new place and still settling in, so be on the look out for a line of little girls dress up 18th century gowns! It's glorious. The picture of the back skirts (at top) is so elegant! That draping is to die for. Oh my goodness gracious...you've blown me away again! I love the soft colors and your hair and the stripes and oh, everything! Especially Historical Dog! I have the Janet Arnold book and it's so nice to see what these drawings might actually look like as real gowns. Thanks for sharing these pictures and your whole process! I love it! And historical dog is adorable! its even prettier in person & i didnt think that would be possible!! Beautiful dresssssss, so precioussss!!! And your dog is such a cutie! Perfect photo shoot! My friend loves your dog! 'm renowned for not checking my typos.